On April 7, 2018, CBC News posted an article titled Think Twice Before Consulting Dr. Google, Researchers Say. Making an appointment with “Dr. Google” is detrimental for many reasons, including the fact that the web is not your doctor. “People treat the web like a doctor, but the web is not taking the Hippocratic Oath,” said Dr. Tim Libert, whose paper “What Web Browsing Reveals about your Health“ was published in the BMJ in 2015. On April 7, 2018, CBC News posted an article titled Think Twice Before Consulting Dr. Google, Researchers Say. Making an appointment with “Dr. Google” is detrimental for many reasons, including the fact that the web is not your doctor. “People treat the web like a doctor, but the web is not taking the Hippocratic Oath,” said Dr. Tim Libert, whose paper “What Web Browsing Reveals about your Health“ was published in the BMJ in 2015. Searching for a diagnosis on the internet is the last thing most people should be doing – it is not only inaccurate, but it can also create a lot of undue worry on the part of the patient. Alternatively, it can also falsely reassure you. In addition to these medical concerns, there is also a privacy concern. Each time you visit a web page, you may be sharing your data with a third party. Canada’s privacy watchdog ruled in 2014 that Google’s use of sensitive health information violated Canada’s privacy laws after it allowed advertisements to be directed at a consumer who had searched for devices to treat sleep apnea. This is of grave concern to Canadians, whose health care information is closely guarded by doctors, hospitals and provincial governments and their agencies. Needless to say, when you or a family member is ill, looking to the internet is not helpful. Maintaining good health is important, and the best way to do that is with professional, evidence-based care that starts with a strong connection to a health care provider. Enter HomeMD, a patient centered health care service that starts with the simple download of an app. This app opens up the world of healthcare and essentially brings it to your door, or device. HomeMD is a safe and all-encompassing alternative to futile internet searches that only function to frighten patients by giving incorrect or incomplete information. HomeMD offers patient-centered, evidence-based medicine that is fast, professional and accurate. 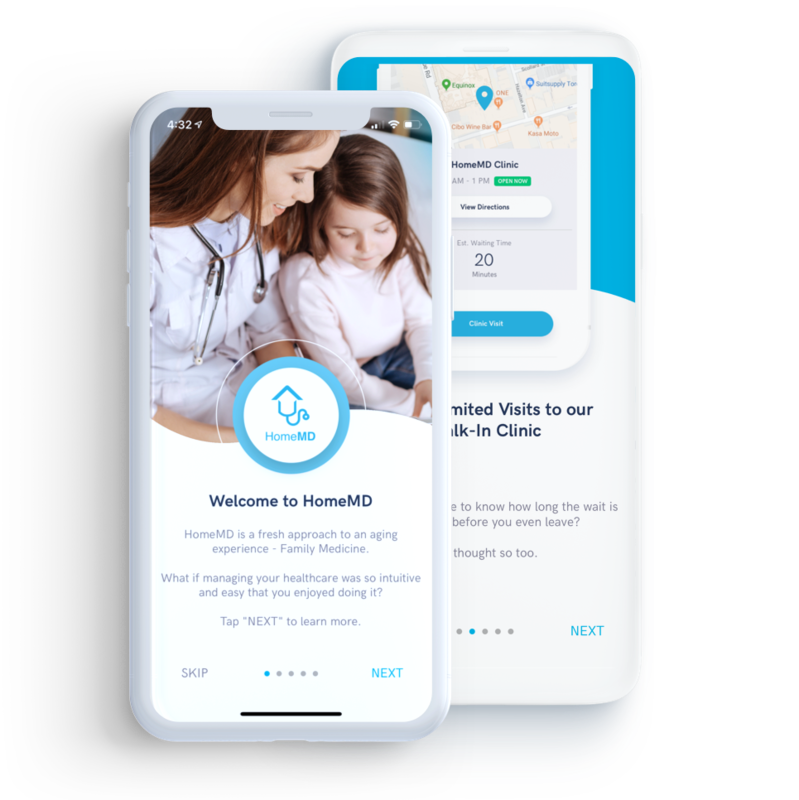 HomeMD is a digital-first primary health care solution that also offers the additional services of home visits and access to a midtown Toronto state of the art medical clinic. There are three levels of subscription. Download the app for free and gain access to our walk-in clinic in mid-town Toronto. Join our family practice for $20 a month you receive unlimited access to telemedicine and appointments in our clinic. The third level is all access for $50 per month, you receive unlimited access to all three platforms, Telehealth, clinic appointments and house calls. Telehealth, or medical video consultation, is a great way to diagnose and treat every day or chronic medical problems that need attention. With the HomeMD app, you will be able to reach a live nurse practitioner who can see you via video conference and help get to the root of the problem quickly and efficiently. Saving you time and effort in getting to a clinic or even an emergency department, having a medical video consultation will allow for a diagnosis and treatment up to 70% of the time. Nurse practitioners are highly trained professionals who are already delivering primary healthcare to over 3 million Canadians. By tapping into this resource, you will be accessing the future of health care – ‘virtually’ solving medical issues with evidence-based medicine. Of course, there are times when a face to face visit is necessary, and HomeMD offers this service as well, whether it’s in our state of the art clinic or in your home. Whatever platform you choose for service, it is the alternative to Dr. Google and WebMD that Canadians have been waiting for. No more sleepless nights worrying over a symptom that Dr. Google has misdiagnosed as a serious illness. A recent study suggests internet health searching could make you feel worse. It could leave you even less informed. This study, by University of Waterloo scientist Amira Ghenai, is part of a growing body of research into the potential side-effects of consulting the internet about health issues — something that creates a risk of “cyberchondria”. Ghenai has shown that many people are confused by the search results and often end up with the wrong impression. Going directly to a well-established source of medical knowledge, like the qualified NPs at HomeMD, is a prudent and beneficial way to get an accurate, timely diagnosis and be on the road to recovery right away. Of course, there are some excellent sources of information on the web, but knowing where they are, what search terms to use to access them and digesting the information may be challenging for a typical non-medical professional. Getting a correct medical diagnosis from WebMD or Dr. Google is a long-shot. Most symptoms are benign, and the ones that aren’t are non-specific. Entering search terms can be difficult as well – knowing which terms to enter to get the results you want can be complex. Avoiding these pitfalls and going to a reliable source of medical knowledge is the best bet, every time. HomeMD services many patients via medical video consultation. Many remote areas of the country that lack doctors or specialists have been served by telemedicine for many years, and now HomeMD offers this service to Toronto residents from the comfort of their home. One click will get you a ‘virtual’ appointment with a professional medical practitioner, who can see and hear you and help make accurate, quick diagnoses. For your next health issue, don’t consult Dr. Google. Get the correct medical diagnosis with a medical video consultation or another platform, offered by HomeMD. Welcome to the next evolution of family medicine in Canada. Now serving the mid-town Toronto area, HomeMD features a powerful new app offering a unique platform designed to make your life easier and healthier. Our new software is the next step in patient-centered care. It reflects our goal to design our family practice around you, our patient, and to provide the treatment you need, when and how you need it. Unlimited Video Consultations with our Medical Professionals. At HomeMD we feel it’s vital to feel trust and confidence in your healthcare team. By not rushing our patients, we deliver superior health outcomes. We take the time to know you as an individual and build a relationship. Your good health is what we care about. Download our app today.